While I hope everyone is using Outlook ;-), I know there are some people who still use Microsoft’s Live Mail client. If you are one of these people (or know someone who does) and it's used it to connect to Outlook.com accounts, you’ll need to use Outlook, the Windows 8/10 Mail, Calendar, Contacts apps, a different email client (take a look at eM), or Outlook on the web to use Calendar and Contacts after your account is migrated to the new server. 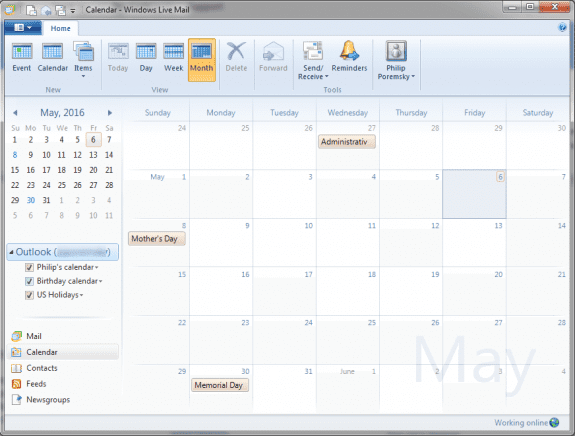 The Live Mail client will no longer sync calendar and contacts with Outlook.com after the account is migrated. You will be able to use it for email, using IMAP (preferred) or POP3. If you're still waiting for your Outlook.com to be moved, as long as you aren't using the address with your Windows Phone, using Live Mail, or sharing a calendar, your account should be moved "soon".